Over 200 University of California, Berkeley professors and faculty are calling for the shutdown of classes and activities during "free speech week," an event scheduled Sept. 24 to 27 that features some "alt-right" speakers. In an open letter to Berkeley community and campus members, the group called for the boycott of classes and for the closing of all buildings, the Los Angeles Times reported. "Therefore, as faculty committed to the safety of our students and our campus, we are calling for a complete boycott of all classes and campus activities while these Alt-Right events are taking place at the very center of UC Berkeley's campus," the letter said. The faculty believes the university should not ask students and staff to choose between "risking their physical and mental safety," and coming to campus for class or work. "As faculty we cannot ask students and staff to choose between risking their physical and mental safety in order to attend class or come to work in an environment of harassment, intimidation, violence, and militarized policing," the letter said. The Berkeley Patriot, a conservative campus publication, is responsible for inviting a number of speakers connected to Milo Yiannopoulos to the four-day event. The student group has not filled out all appropriate paperwork for the event, but campus spokesperson Dan Mogulof did confirm the group has reserved the Sproul Plaza steps for the event. Speakers include Yiannopoulos, Anne Coulter, and former White House chief strategist Steve Bannon. Yiannopoulous and Coulter have both had events cancelled at the university in the past year. Conservative personality Coulter was scheduled to speak at the university in April, but she canceled the event after a conflict between her and school officials, who feared violence could break out. Berkeley College Republicans had invited right-wing provocateur Yiannopoulos to speak last February. The event was "abruptly canceled when masked left-wing anarchists rioted outside the event to shut it down," according to Fox News. The faculty and staff who wrote the letter acknowledged UC Berkeley is "bound by the Constitution to allow all viewpoints on campus," but also said there are "forms of speech that are not protected under the First Amendment." "We recognize that as a public institution, we are legally bound by the Constitution to allow all viewpoints on campus. However, there are forms of speech that are not protected under the First Amendment," the letter said. "These include speech that presents imminent physical danger and speech that disrupts the university's mission to educate." University Chancellor Carol Christ addressed the campus free speech issues in an interview Thursday. "Free speech has itself become controversial," she said. 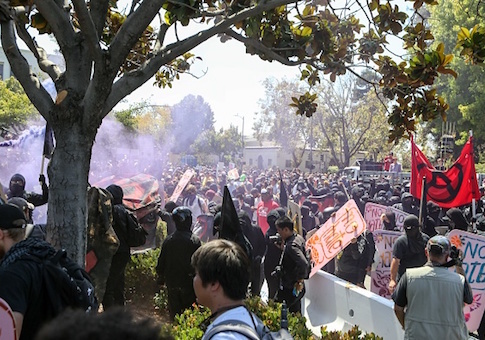 The university is taking precautions leading up the event in the wake of past Berkeley protests that turned violent, and growing tension on campuses around the country. Bomb-sniffing dogs, barricades, and the shutting down of main street have all been seen on campus. "We take so seriously the safety of our students, the security of our campus, that we have to prepare for the worst even hoping that the worst won't happen," Christ said. Conservative commentator and Daily Wire editor in chief Ben Shapiro spoke on campus Thursday night. The event was relatively peaceful compared to past events, and was described by UC Berkeley spokesman Dan Moguofl as "successful." Security costs for the event were estimated at $600,000, and authorities arrested nine individuals. Following the event, Shapiro commented on lessons learned from what he described as a "terrific" visit. "The students were engaged; the police were finally allowed to do their jobs. Antifa stayed away. Sure, there were protesters—lots of them. That's great! It's a free country, and they're free to say whatever stupid nonsense they want to," Shapiro said. This entry was posted in Issues and tagged Ben Shapiro, California, College Campuses, First Amendment. Bookmark the permalink.